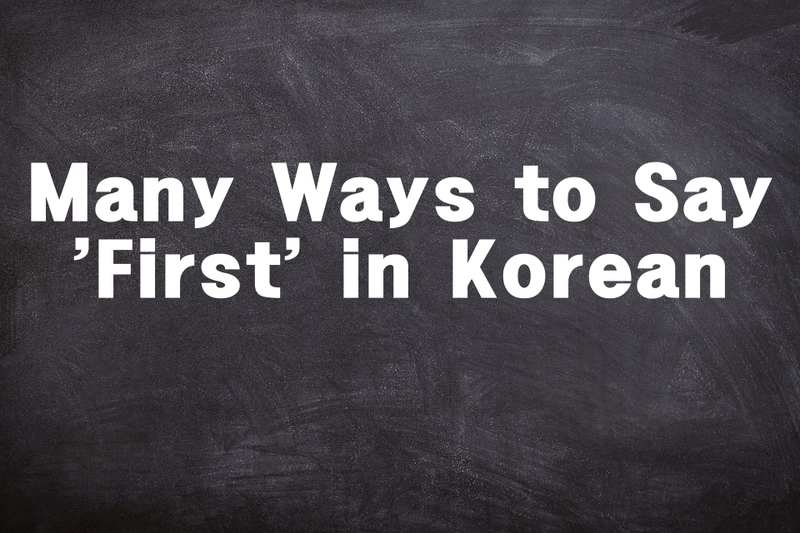 Let's take a look at different ways we can say first in Korean language. 첫- is placed before nouns such as first love, first snow, first day. (Mom), who is your first love? We fought hard on the first day. 첫번째- is used when enumerating things in a sequence as in an essay, speech, or instruction. 첫번째 우리 나라에는 'mano po' 이라는 문화가 있어요. First, there is a culture called 'mano po' in our country. 첫번째, 한국인들은 감옥에서 나갈 때 두부를 먹어요. First, Koreans eat tofu when they get out of jail. 첫째- is interchangeable with 첫번째 but it can also be used to refer to the first child in a family. 우리 첫째는 이제 군대에 갈 거야. My first child is now going to the army. My first child is a boy. My first child made it to Seoul University. 처음- is used with verbs to mean the first time to do something. We can attach some particles to it like –에, -으로, and 부터. 처음에 광수가 니 동생인 걸 물랐어. At first, I didn’t know that Gwangsoo is your little brother. When was the first time you had a boyfriend? 남자 이렇게 많이 우는 거 처음 봐요. It is my first time to see a man cry like this. 우선 and 일단- are commonly confused words. Sometimes, they are interchangeable. Sometimes, they’re not. 우선 is more of before anything else while 일단 is more of for the time being. But in the case where you have done something already, only 일단 is used. Here are two examples. 일단 (우선) 우리는 주말 계획을 세워야 해. First, we should make plans for the weekend. 일단 계획을 세웠으니 돈을 좀 모으자. Since we’ve already made plan, let’s get some money first. 먼저- also means first and is interchangeable with 우선. It is also often used in commands. I will go first (ahead). First, I have something to tell you. 등- means rank and it is attached to numbers. Hence, to say someone is first in rank, we say 1등 (read as 일등). I have to be first place. The first placer is Kang Daniel.